Hello my lovelies! Sorry I haven't kept my promise of posting more this week. My nails are still in a less than perfect shape and I haven't been doing them that often. They are improving and starting to grow though, so I'm feeling optimist about them. Today's post is about a polish that has been in my collection for a few months. I didn't like the pictures from when I first wore it so I didn't post them back then. After a few weeks I wore it again and I wasn't that happy with those pictures either. That's when I realized that this polish is too amazing to be photographed and decided to just post the photos I have so hopefully you can get an idea of its awesomeness. So here we go! 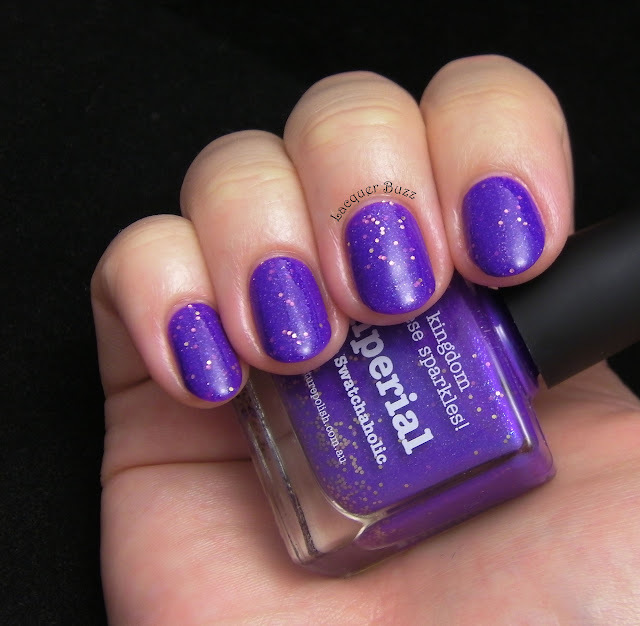 Imperial is the shade created by The Swatchaholic, one of my favorite bloggers of all time. When you are a big fan of someone you admire everything they do, but this polish is so awesome that I think I would have liked it no matter what. I always dreamed of having Imperial in my collection so I jumped at the occasion when it was finally available to me. It's a very bright shade of medium purple, not quite a neon but close. It always photographs more blue than it is in real life. It's filled with tiny blue and purple shimmer and larger pieces of copper glitter. The combination is truly original and beautiful. The formula is great, making this polish a real pleasure to apply. It only needs two coats to be opaque, but you should use three if you do your coats very thin. I had no trouble getting the glitter pieces on my brush. You should, however, shake the bottle a bit if you haven't used it in a long time. The finish is pretty rubbery after it dries, so naturally I applied a top coat to make it shiny. Here's a photo taken in direct light. All in all, I'm in love with this nail polish. If you like purple (who doesn't?) and bright colors you should definitely get it. If my pictures didn't convince you, trust my advice. It is much more amazing in real life than in any photograph!